Lunch break is coming to an end and things are pretty hectic in the Capitol Theater’s Club auditorium (one of the main venues at Tanzkongress 2013). Everyone is preparing for the Motion Bank score release ('Using the Sky' with Deborah Hay). William Forsythe is speaking with curator Pirkko Husemann, who goes out for a quick bite before the event begins. Outside, the sun is shining; the last of the gorgonzola risotto is being served on plastic plates. Inside, pink light illuminates red-velvet chairs, which the tech crew is putting into position. Digital artists Florian Jenett and Amin Weber are preparing the presentation. All of the speakers are wired with mikes. Jonathan Burrows is conversing with Deborah Hay’s assistant, Michèle Steinwald from Canada. Composer Matteo Fargion is relaxing on the side of the stage. Motion Bank project leader Scott deLahunta is rehearsing his remarks as moderator. Up on the dais, Hay is surrounded by men. “I don’t have any grandchildren,” Matteo Fargion has just intoned, so that the tech crew can check the sound. The interpreters from translating firm Bettina von Arps-Aubert have settled into their booth. They will provide a simultaneous translation of the speakers’ remarks, even though the audience is so international, almost no one will need to don the company’s headphones. It’s a challenge all the same, since interpreters need about 10 percent more time to get a sentence into German than the speaker needs to say it in the original English. Tanzkongress 2013 Images Left to right: Outside Capitol Theater Club, Amin Weber presenting 'Using the Sky' website content, Deborah Hay viewing the Motion Bank installation. Photo: Tanzkongress 2013. Gradually audience members enter and, when it’s time to start, deLahunta welcomes them to the event. 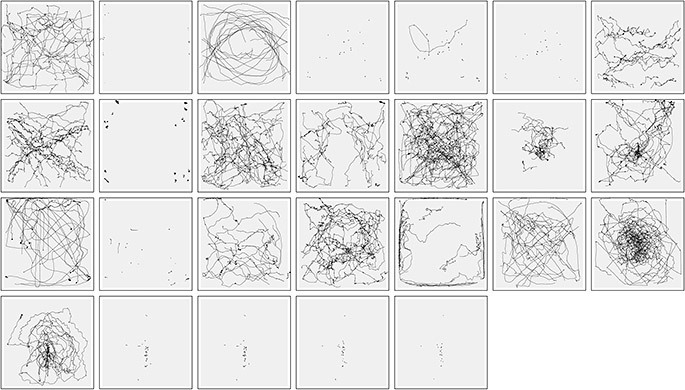 "Motion Bank, a four-year project, is creating online scores for choreographic pieces and is making them available through the Motion Bank digital archive", he explains in his introduction (download talk here). He asks the participants in the panel discussion what motivated them to document their various artistic efforts. Hay says she couldn’t make sense of what others wrote about her work, which is what inspired her to publish her own writings such as 'Lamb at the Altar: The Story of a Dance' (1994) and 'My Body the Buddhist' (2000). Jonathan Burrows says he wrote his 'A Choreographer’s Handbook' (2010) to create a record over several years of his collaboration with various artists. Publishing it allowed him to get some distance to his own work and free himself up for new ideas. William Forsythe explains that one reason Improvisation Technologies, a “digital dance school,” (first published in 1999) exists and serves as the basis for his improvisation techniques is because a new generation is arriving on the scene and it’s now technically possible to archive movement. After this exchange, deLahunta explains how Motion Bank went about creating the electronic score: Hay sent an 18-page booklet (download a copy here) containing directions for staging her solo piece 'No Time to Fly' to three choreographers, who spent three months learning it at different locations in New York and Australia. In April 2011 they all traveled to Frankfurt, where each dancer was recorded seven times, producing a total of 21 videos, which became the basis for the digital transcription and subsequent production steps (see Deborah Hay Test Filming and Solo Filming reports). Then digital artist Amin Weber talks about what he does. “I created an animated film from memory that allows you to recognize Hay’s dance. The system shows you a digital figure moving through space, depicting the tension I experienced during the performance.” It’s a digital interpretation of Hay’s work, a digital choreography of her dance. “I work with my little abstract bodies, the dancers work with real bodies,” Weber says. “It therefore becomes an expansion of reality” (see Digital Adapation Set in the on-line score). Hay says her having inspired such an expansion among others gives her a wonderful feeling. “That means people can find the tools online they need to expand their art,” she explains. In conclusion, the panel’s participants have another opportunity to express their thoughts on the Motion Bank project. Forsythe says dancers are not the only ones interested in the databank; so are people from other disciplines.“You don’t need to keep thinking about your own ideas anymore,” he says with a smile. “Others will do it for you.” Hay says, “These guys have shown me how limited my thinking was.” And Burrows points out that in terms of the digital figures, it’s not so much about focusing on individual body parts as it is about looking at entire processes of movement. “It’s almost post-human,” he says. 1. What if dance is how I practice my relationship with my whole body at once in relationship to the space where I am dancing in relationship to each passing moment in relationship to my audience? What if the depth of this question is on the surface? 2. What if my choice to surrender the pattern, and it is just a pattern, of facing a single direction or fixing on a singularly coherent idea, feeling or object when I am dancing is a way of remembering to see where I am in order to surrender where I am? People begin to kneel and make circles with their bodies, inspired by the text. After they respond to another question from the score, they are asked to create a question that they can apply to their own way of perceiving. After that, they come together in groups to test their responses to other participants’ questions. What sounds a bit abstract is in fact meant to make clear the conditions dancers in different countries faced as they learned Hay’s piece No Time to Fly. And even though each dancer has his or her own method of approaching the work, the screen on which Jenett and Weber are projecting their presentation makes clear that there were similarities in how the different performers dealt with the task. The workshop participants spend two hours trying out approaches they can use with their own work in the future. By the time the workshop ends they have become familiar with different structures and explored their own way of working with Hay’s tools. Held in tandem with other Motion Bank activities, Dance Engaging Science is a series of workshops that brings experts from various disciplines together to develop new forms of collaborative research in the area of dance. At today’s open panel discussion, Scott deLahunta explains that the goal of Dance Engaging Science has been to survey the current state of interdisciplinary dance-science research and, following that, lay the foundations for further interdisciplinary research. In contrast to dance studies, which carry out research on dance, the specialists participating in Dance Engaging Science use dance to test their own theories. Some of the specialists have come to Düsseldorf to describe their experiences; they include theater studies professor Maaike Bleeker from the Netherlands, philosopher Alva Noë from the United States, architect Michael Steinbusch from Germany and Forsythe dramaturge Freya Vass-Rhee. What becomes clear is that the Dance Engaging Science workshops have raised multiple questions that still await answers. A number of them are articulated by Noë: What is awareness? What is perception? What is presence? Dance, he says, offers the possibility of investigating these issues. Noë explains that he became aware of Dance Engaging Science through neuroscience. His theory is that consciousness is not anchored in the brain but in each individual’s relationship to time and space, and an astonishing commonality shared by the two disciplines is the idea that knowledge about dance is not stored in one specific location, but is defined by moving through time and space. “My theories are old news in dance research,” he says with a laugh. Vass-Rhee tells of a video artist that she asked to participate but who got scared and declined, saying he didn’t want to know how art works since that is how you break its spell. Steinbusch explains that he tried to identify the structural similarities between dance and architecture. He found that the basis of architecture is making distinctions, such as between left and right or inside and out, and that making such distinctions is the main element dance and architecture have in common – both are combined disciplines. Bleeker says that she is developing a website that will have interviews with workshop participants. She found it beneficial, she says, to reflect on the relationship between research and dance, adding, however, that it is becoming more difficult to get financial support for projects that do not offer a predetermined outcome. In response, deLahunta assures her that exactly such projects are the ones needing support. “We need to make our experiences available as soon as possible, without putting ourselves under pressure to present results,” the Motion Bank project leader says in conclusion. For documentation and reports on the Dance Engaging Science project. Dance Engaging Science Panel at Tanzkongress 2013. Photo: Tanzkongress 2013. In recent years, numerous choreographers have tried to make their work generally accessible using digital media. 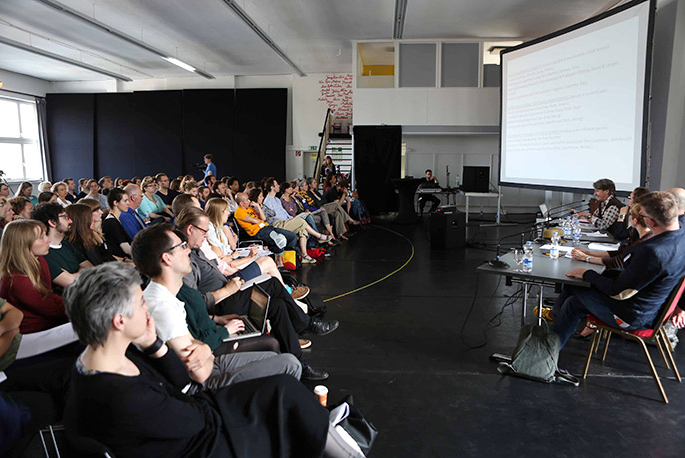 Participants in the Choreographic Resources Lab, which include students in the Master’s program in Contemporary Dance Education at Frankfurt’s University of Music and Performing Arts, are being given the opportunity to examine the tools choreographers have developed for use in education and professional dance practice, comparing their similarities and differences. To do this, the students have formed groups which will spend the next hour and a half moving through the room. Choreographer Jason Jacobs, for example, has been joined by his fellow student Gregory Livingstone in leading the group that is working with the book A Choreographer’s Score by Anne Teresa De Keersmaeker and the performance theorist Bojana Cvejić. First the participants are to adopt a neutral position and then create one movement, followed by another. Then they are to learn someone else’s movement and, finally, put together a dance from the various parts. The song “Somebody That I Used to Know” by Gotye is playing in the background. In the outer courtyard students are now also dancing under the direction of Ola Scibor und Anja Bornšek to movements from Jonathan Burrows’ A Choreographer’s Handbook, accompanied by the Beatles song “Ob-La-Di, Ob-La-Da.” In the group working with Steve Paxton’s DVD Material for the Spine, the dancers are using their bodies to respond to sounds, such as those made by someone peeing, giving them expression and reproducing them again and again. A final group led by Miranda Glikson is working with William Forsythe’s Synchronous Objects for One Flat Thing, reproduced and the interactive score for Deborah Hay’s No Time to Fly. The goal is to work with spatial structures. What the audience sees are collective choreographies. It’s possible to discern the individual elements that make up the overall composition. Yet the choreographers have different methods of explaining their tools. While De Keersmaeker and Paxton provide detailed descriptions of their work, in his Choreographer’s Handbook Burrows lists all of the questions that he feels are important to address when choreographing a piece and dispenses with any illustrations. For Motion Bank, however, it’s about perceiving the structures of dance. List of recent choreographic resources/ publications. Motion Bank Phase Two is evolving in stages. Currently we are improving our on-line annotation and publishing systems (MoSys) for eventual public release to join PM2GO. We are building a network of choreographers, dancers and researchers interested in using MoSys for their own purposes or adding resources to Motion Bank. We are organising Choreographic Coding Labs in collaboration with new partners worldwide. These Labs bring together creative coders interested in translating choreography and dance into new digital forms. In addition, we are supporting the continued research of the International Education Workgroup. Sign up for the newsletter to be kept informed.